Welcome to my scientific research webpage! 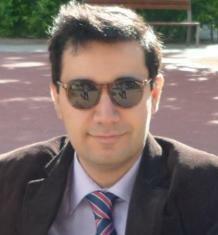 I am Arash, a Persian mathematician, born in 1985 in Mashhad, Iran. I was trained as a harmonic analyst. My research interests and experiences consist of a wide range between pure mathematics (Representation Theory & Abstract Harmonic Analysis & Operator Theory), applied mathematics (Constructive Approximation & Mathematical Physics), mathematical modeling, and computational science. As a personal rule, I am always looking for new challenges and adventures in science. I did my PhD in pure mathematics (Classical Mathematical Analysis) at Ferdowsi University of Mashhad (FUM) in Iran (where I had also obtained my BSc and MSc in pure mathematics), on abstract non-commutative harmonic analysis methods in coherent state/covariant transforms. I am currently a postdoctoral research scholar in the laboratory Robot and Protein Kinematics (RPK) at Department of Mechanical Engineering (Whiting School of Engineering) in Johns Hopkins University (JHU), working on abstract non-commutative harmonic analysis and representation theory methods in applied science including Mathematical Crystallography, Robotics, and Biophysic (Protein Kinematics and Protein Folding). Recently I also got interested in certain aspects of Theoretical Computer Science.